St Patrick's Cemetery: Philip our grave digger has pointed out that there is very little space in our cemetery for new graves. It is therefore necessary to change our previous policy of providing graves to non-parishioners. From now on new graves will only be provided to people who are parishioners of Our Lady & St Patrick’s and to those people who, while not living within the parish, have made this parish their regular place of worship. Also, edging stones are not permitted according to diocesan regulations, even though this is commonly known, edgings have been installed around some graves without any permission being sought or given. From now on edgings may only be installed once the grave is full and/or there is NO FUTURE INTENTION TO REOPEN THE GRAVE. As all will understand, the cemetery should pay for itself and costs do not get any cheaper. 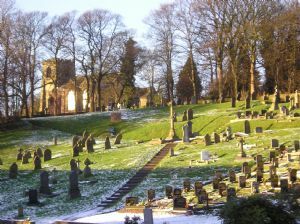 The list of costs and fees for the cemetery has had to be revised and updated and is posted at the back of church. A copy is also available here. 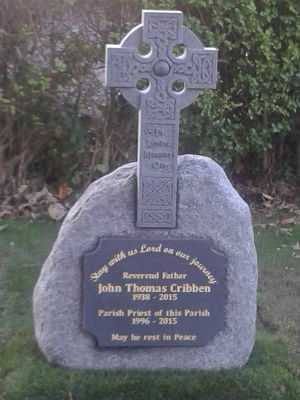 Fr Cribben's headstone has now been erected. A very fine token of the esteem and respect of all our parishioners. I am sure that you will agree that the memorial stands well and proud as it is and that to crowd it round with plants etc. would take away from its natural simplicity and dignity. The greatest offering we can give to Fr Cribben's memory is our prayer. We respectfully ask all, therefore, to not place plants near the grave; a single vase for flowers is now situated near the memorial.